Here at Durin’s Threshold, the westernmost edge of Moria, the new colonists of Khazad-dûm store supplies brought in from Eregion and bound for outposts deep within the Dwarf-city. Here, at the foot of the grand stairs, where new stables have been raised and old forges have been lit, great new sagas begin beneath the mountains. Dwarves labor to revitalize their ancient home by unpacking their gear, exploring the darkest regions, patrolling the nearer ones, and stoking the fires of their hostel furnaces. A Stable-master waits to greet newcomers. Weary yet eager Dwarves seek out brave souls and strong arms to share the burdens of exploration and defense in these early new days beneath the mountain. Here, at least, haggard adventurers from Eriador can take a breath before braving the many perils to come. 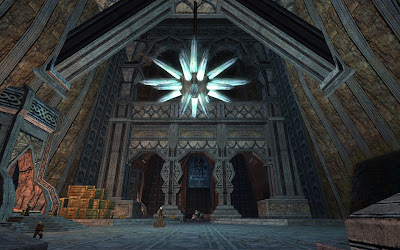 Durin’s Threshold is comprised of three halls, with the grand entryway in the center and wings of furnaces to the north and south. Each is handsomely crafted in the manner of the Dwarves but modest compared to many of the older halls beyond. 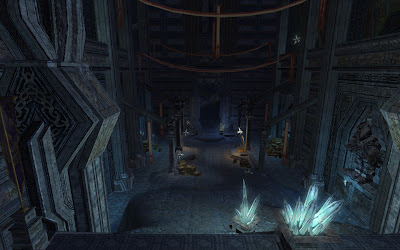 The masons of Moria designed these halls to whet a visitor’s appetite before he feasts on the visions within.